What Is The Ideal Wedding Gift? 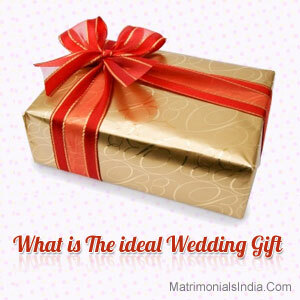 » What Is The Ideal Wedding Gift? If one of your dear ones is getting married soon, then make sure you don't lack behind in expressing your good wishes and happiness. Be it your brother, sister, friend or any acquaintance, the most appropriate way for you to convey your feelings is in the form of a gift. You must choose and buy a present that reflects your thoughts in the best possible manner. What Not To Do? Most of the people get too excited about the wedding and start wondering about things that they don't have to do much with. It is most likely that they would try to find out- who the groom or the bride is? What does he or she do? What would the venue be? Which outfit should they wear? and other such things. Somehow, nobody thinks about the gift they should give. What To Do? Try to find out that what would be the ideal present for the couple, as soon as you get the invitation. If possible, get an idea about the likes and dislikes of the bride, the groom or both. Artistic Presents : You can always gift the couple a nice piece of art. Go for designer flower pots, bedspreads, wall hangings, artistically designed mirrors. Such gifts are cherished for a long time. Pampering Fundas : You can pamper the couple by booking a luxurious hotel room for them. You can also gift tickets for a honeymoon trip. Additionally, you can give vouchers for a spa therapy. Tech Savvy Options : If you gift the latest gadget to the couple, chances are that your gift will be considered the best. There are innumerous options available- an iPad, a Digi-cam, a Camcorder, an Android phone, etc. Old Is Gold : The conventional gifting option of giving cash can never be out of the trend. You can also gift the couple a set of dinnerware, a set of bedspreads, etc. These things are needed daily. Thus, there gifts remind the couple about you every time they will use it. Now that you have a number of options to choose from, don't wait! Buy the gift that you find the most suitable and get ready to receive the appreciation for expressing your feelings in style. I am really grateful to the owner of this web page who has shared this wonderful piece of writing at this place.